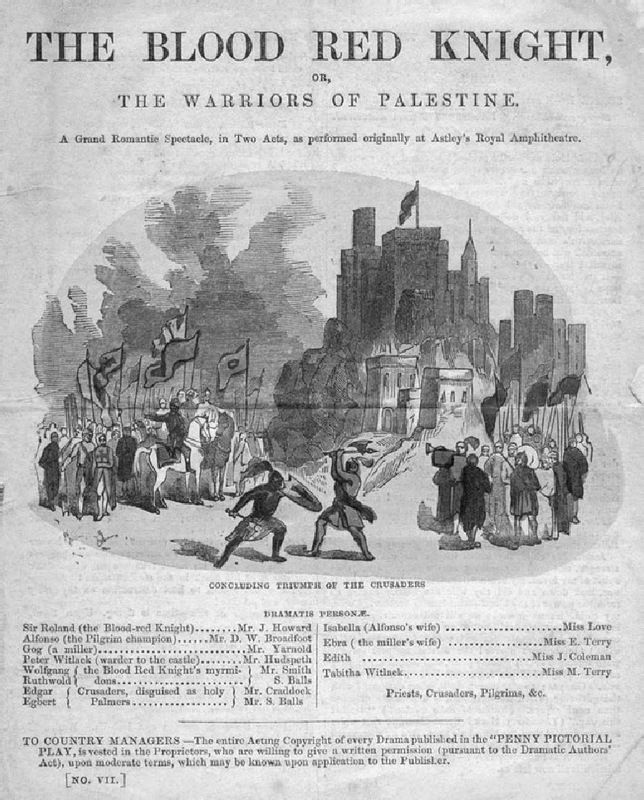 Although historians of the British theatre have long been interested in representations of the “East” on the nineteenth-century stage, few have explored plays depicting the medieval Christian quest to liberate Jerusalem and the Holy Land from Muslim rule. 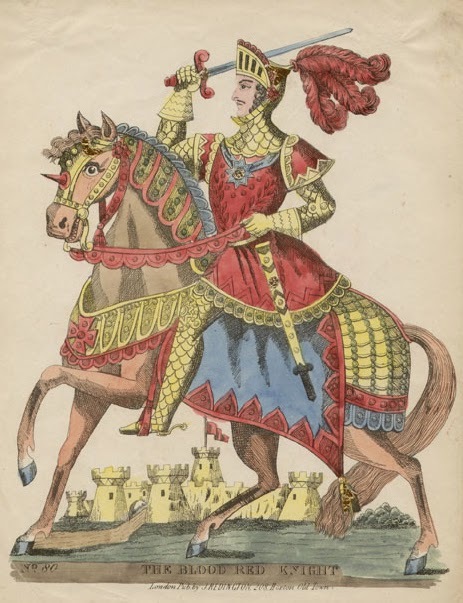 The popularity of theatrical representations of the Crusades in the first half of the nineteenth century coincided with the British public’s growing curiosity about the Near East. Tourism to the main Crusade sites rose sharply with improvements in transportation. Artists and engravers brought images of the Church of the Holy Sepulchre, the Damascus Gate, and the Dome of the Rock directly into homes; the exploits of archaeologists in Palestine made newspaper headlines; and enormous, topographically accurate panoramas of biblical landscapes drew crowds across London. A gigantic moving diorama of Jerusalem, for example, complete with Mount of Olives and Garden of Gethsemane, drew crowds to Hyde Park Corner in 1851, the year of the Great Exhibition. Eastern-themed novels, poetry, children’s literature, missionary tracts, journals, and pictorial art of all kinds were widely available. Theatrical managers, ever on the lookout for new ways to tap into the public’s enthusiasms, were quick to take advantage. The following examples, which are representative of the genre, demonstrate how playwriting offered considerable scope to the romantic imagination and plenty of room for an idiosyncratic interpretation of historical events. Characters from the play were depicted in tinsel prints, a uniquely nineteenth-century art form that was popular between 1815 and 1830. Tinseling enthusiasts bought plain or colored prints, then added costumes made of die-cut metal foils, called tinsel, as well as bits of fabric, leather, or any other material. The blood-red knights shown at the top of this post and below might once have had real feathers on their helmets. When completed, tinsel prints would glow like religious icons. 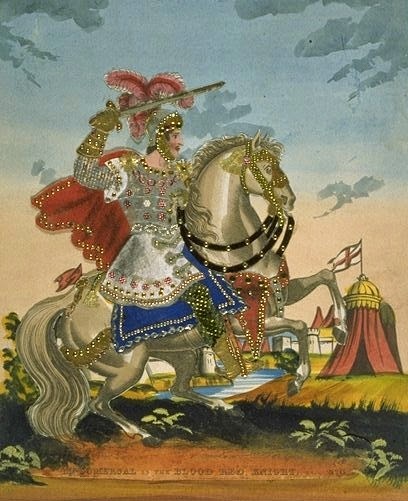 A lavishly tinselled version of "Mr. Gomersal as The Blood Red Knight"
The Crusaders; or, Jerusalem Delivered at the Royal Coburg Theatre in 1820 was billed as “an Entirely New and Splendid Melodramatic Tale of Enchantment, the Main Incidents of which are Taken from Tasso's Poem of ‘Jerusalem Delivered,’ Interspersed with Songs, Duets, Glees, Choruses, Marches, and Combats, with Entirely New Scenery, Extensive Machinery, Dresses, Properties, and Decorations.” The First Crusade was less popular than the Third Crusade as a dramatic subject during the nineteenth century. Nevertheless, playwrights inspired by Tasso’s “Gerusalemme Liberata” could depend on their audience’s knowledge of that poem, which was available in a number of English editions and translations. 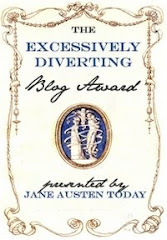 Its lyrical passion found a warm reception among the Victorians later in the century, who could appreciate the struggles of characters torn between love and duty and for whom historical inaccuracy was no impediment to enjoyment. The Royal Coburg production appeared the same year that Charles Mills published his magisterial two-volume History of the Crusades for the Recovery and Possession of the Holy Land, one of the earliest studies devoted specifically to that topic – and one critical of the Western religious fanaticism that inspired the wars. Yet the impact of such historical scholarship was negligible on a general public that preferred to get its history lessons in the popular theatres of the day. This has not changed much from the Victorians’ time to ours. Compare the number of people who have dipped into The Oxford History of the Crusades (thousands, maybe?) with the number of those who have seen Kevin Costner’s Robin Hood: Prince of Thieves or Ridley Scott’s Kingdom of Heaven (millions). These recent films are the direct descendants of the nineteenth-century sack-and-slaughter plays. In 1827, seven years after producing The Crusaders, the Royal Coburg produced The Unhallowed Templar, a three-act play billed as “an entirely new Grand Historical-Romantic Legendary Spectacle.” This time the subject was the Third Crusade, with much of the action focusing on the various engagements between the Christian forces commanded by the English King Richard I and the Muslim forces led by Saladin. In fact, this encounter of two towering personalities is tailor-made for the stage, which is why plays based on incidents of the Third Crusade outnumber all others during the nineteenth century. No matter that Richard and Saladin never actually met face to face – that inconvenient historical truth did not trouble the playwrights who wrote to fill London theatres. In nearly every one, there is stage combat of the most sensational kind, often on horseback, between the two leaders. 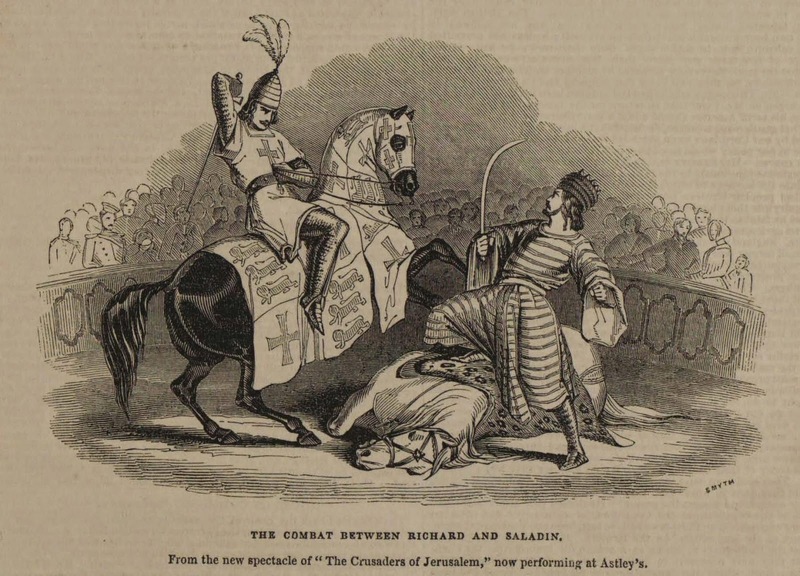 So we have, in 1843, a play at Astley’s Amphitheatre called The Crusaders of Jerusalem, which featured a violent encounter between Richard and Saladin. Above is an artist’s rendering of this scene. Such depictions must have made an indelible impression on audiences and shaped how they thought about England’s role in the historical Crusades. 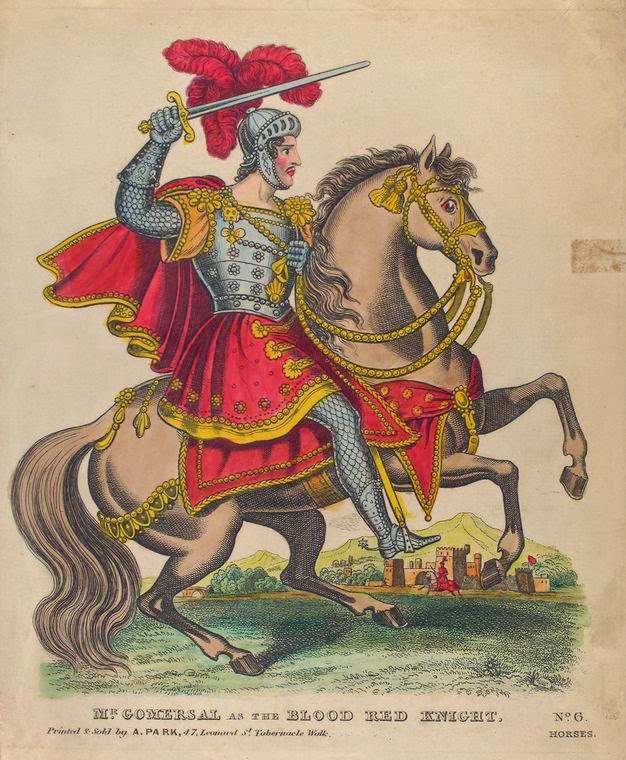 Certainly they had an impact on later artistic representations, including the work of Gustave Doré, who illustrated an English edition of Joseph Michaud’s History of the Crusades in 1877. Below is a plate from that work featuring the iconography that had developed around the completely fictional meeting of Richard and Saladin. 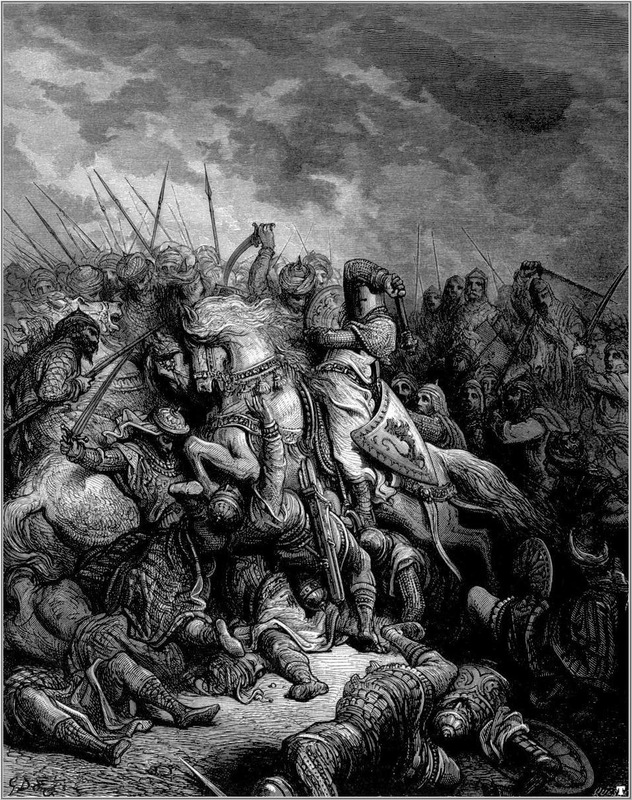 Gustave Doré (1832-1888),"Richard the Lion-Heart and Saladin at the Battle of Arsuf,"
In these plays, Richard is always portrayed as a heroic exemplar of English honour and liberty. Saladin himself behaves in admirable ways – and he was revered by some British writers, including Sir Walter Scott, who compared him favourably with European sovereigns. Still, these plays leave no doubt that the “barbarism” of the Muslims must be extinguished, and that is invariably what happened on stage. And speaking of Sir Walter Scott … it would be hard to overstate his influence in creating and perpetuating nineteenth-century romantic notions of the Crusades. Productions of plays based on Ivanhoe and The Talisman, in particular, were instrumental in transmitting these ideas to an audience well beyond those who read the books. The first dramatisation of Ivanhoe, for example, appeared at the Surrey Theatre in 1820 within weeks of the novel’s publication and inspired a further 290 versions over the following decades. One witness of the Surrey production compared its effect to the feeling inspired by a stained glass window or a Gothic chapel full of shrines, banners, and knightly monuments. Dramatists often played fast and loose with Scott’s story, creating pastiches derived from multiple sources in the interest of heightening its spectacular elements. It was also transformed into opera, pantomime, burlesque, and toy theatre versions. Although Ivanhoe was the most widely adapted of Scott’s Crusade novels, The Talisman was also extremely popular. The first theatrical adaptation of this story of the Third Crusade was produced in Edinburgh in 1825, and more than 70 other versions followed over the course of the century. In the novel, which is set in Palestine, the Scottish knight Sir Kenneth is charged with guarding the standard of Richard the Lionheart’s camp overnight, a task he undertakes with his faithful deerhound Roswal. When Kenneth abandons his watch temporarily, the villain Conrade of Monserrat steals the banner, wounding Roswal in the process. Later, as Conrade marches in a procession before the king, the dog leaps at him, seizing him by the throat, revealing him as the thief. 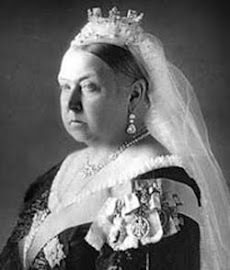 The Knights of the Cross; or, The Dog of the Blood-Stained Banner was just one of many mid-Victorian plays that used this plot as a starting point. It was performed in 1841 at the Royal Albert Saloon, an establishment specializing in burlesque, comic ballets, and melodramas. The success of this adaptation led to a vogue for plays featuring trained dogs, who often upstaged the human actors and became stars in their own right. A slightly earlier play called The Siege of Jerusalem, also based on The Talisman and shamelessly mixing fact and fantasy, featured Saladin’s capture of the Holy City, a view of the Dead Sea, the arrival of the French and Austrian fleets, the burning sands of the desert, an appearance by Saladin’s white bull, a “Grand Asiatic Ballet,” the encounter between the Leopard Knight and the Templar – which is straight from Scott – and a feast in Saladin’s camp. The audience certainly got its money’s worth from that one. Each of these plays referenced tropes about the Crusades that swirled through Victorian society. Crusade plays simplified these down to their basic elements and then exploded them out into a three-dimensional sensory feast, using every trick and technique in the arsenal of stage management. They were, truly, spectacles that cemented a highly romanticized version of the Crusades in the nineteenth-century British imagination. Finally, I’d like to share an image that brings the legacy of nineteenth-century theatrical representations of the Crusades crashing into the modern age – one that links the world of stage melodrama with the beginning of the modern age of film. The image on the right shows two American suffragette bill posters, one of whom is just outside the frame on the right. 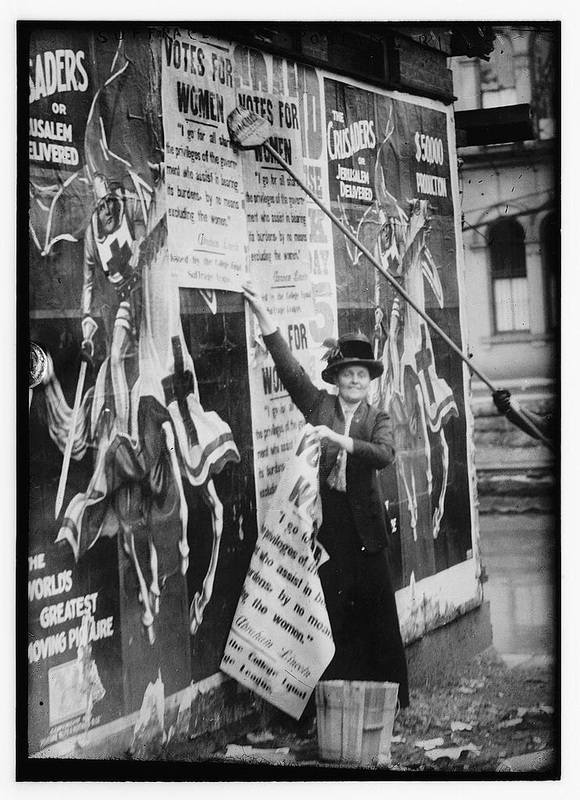 They're pasting their “Votes for Women” posters over two advertising posters for a silent Italian film called The Crusaders, or Jerusalem Delivered that was released in the U.S. in 1911. The film was based on Tasso’s poem, making it a direct descendant of the Royal Coburg play of the same name. With one swipe of a big brush, one historical crusade is replaced by another.